Hey plant enthusiasts! Happy Spring in the northern hemisphere or in the southern hemisphere Fall! Not sure about you but, i am way buried in work right now... Currently in transit from traveling abroad for the Medicine’s from the Edge conference and to do research for the Plant Allies Network map through Plants and Healers International. Tomorrow we have our organizing meeting for the southeast Permaculture Gathering, Wednesday i present about Appalachian Ethnobotany at the Reuter center of University of North Carolina Asheville and then off to the Piedmont to present more about Appalachian Ethnobotany at North Carolina State University for the class of Dr. Jillian de Gezelle and all weekend at the third annual Piedmont Earth Skills Gathering www.piedmontearthskillsgathering.com! Many more events are upcoming of which most you can see under the events tab of the Botany Every Day site…Hope to see some of you in person down the line. Nonetheless, excited to be starting this year’s class right at the beginning of our season for rebirth and renewal. Here we have a chance to rekindle our passion for the natural world and plants in particular. This is also an opportunity to collaboratively add to our collective pool of botanical knowledge. This knowledge is a crucial piece to any future sustainability as well as a whole lot of fun when employed appropriately. 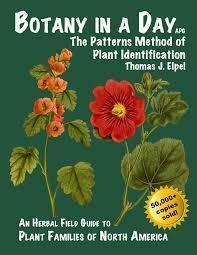 The text for this class is Botany in a Day 6th ed. by Thomas Elpel (2013). This handy resource covers over 100 families and 1000 genera. The majority of all the plants of the Northern temperate world are encompassed at least at the genus and family level. Near the end of this year we will discuss further which families are not covered. This new edition has more information and updated classification reflecting a lot of the changes that have occurred over the last ten years. Elpel’s new edition now mostly conforms with the changes wrought by the Angiosperm Phylogeny Group (APG) (Chase & Reveal, 2009; Group, 2009; Haston, Richardson, Stevens, Chase, & Harris, 2009). You might want to update and pass along your 5th edition (2004) to some person or organization just beginning their botanical journeying. However, the fifth edition will still be serviceable if you find it to be necessary as your textbook for this course. Many other resources are also cited as the classes are posted to prompt and inspire further study and dependability of information. This class is a continuation of a course Frank Cook offered through email for 9 years. Frank passed away over five and a half years ago and i have picked up the torch while also bringing this class to a website format. i strive to continue the work of Frank in a proactive way, honoring his past contributions, current inspiration and the evolving needs of our community of plant people. More on Frank can be found under the About Us tab on this website and at www.plantsandhealers.org. The support of numerous friends has allowed both Frank’s work and my own work to continue. i also function as the Executive Director of Plants and Healers International which is a non-profit established to continue the work of Frank as well. Much more information in this regard can be seen at the website above. A complimentary and very active Facebook group by the name Botany Every Day has grown to over 4000 people from around the world! Amazing that this time last year that number was just over 2,400. Oh life in the modern age. Currently photo albums from each of the later classes will still be posted to Facebook though you don’t have to be a member to view them. Past classes and their photo albums can be viewed under the archived classes tab. 7 song www.7song.com , the great Northeastern botanical educator has contributed quite a bit to the Facebook group in particular. Over the years 7 Song has formally instructed many folks who are now considered amazing teachers in their own right including the afore mentioned Frank Cook, as well as Juliet Blankespoor www.chestnutherbs.com and Corey Pine Shane www.blueridgeschool.com among others. 7 Song and i have mostly interacted with each other on plant walks at the annual National Rainbow Gatherings held in a National Forest in a different state each year around July 4th . Further info on the Rainbow Gathering can be found at the following website www.welcomehome.org. Plant walks happen at Rainbow almost every day. All classes at Rainbow are also offered on a voluntary basis. This is one of the best possible chances to learn botany intensively for free. Our Role of Engagement in This Adventure and the Power of Intention! However, please decide now what type of commitment you can bring to this class. Try to honor that commitment by reading, reviewing, reflecting and getting out in nature. Pick at least one place that you will visit regularly, (weekly to at least monthly). There you will witness the cycling of the seasons in a conscious and observant way. Pick a few places if possible that represent different ecotypes which you can visit seasonally. Try to read the posts and suggested section of text as much as possible. Write to me of your intentions. This will help secure your commitment and also give me a sense of who is on the journey this year. My intentions for this year are to integrate Frank’s commentary from past classes more, add more plant family monographs under the Plant Families tab and cover new categories of ethnobotanical/ecological interest in the classes including Spiritual Uses of plants, European plants and Wetland, Carnivorous, Artic, and Desert Plant groups as well as more information and photos for other classes. I also hope to institute a webinar component within the next month or so as well. All identified species have a distinct two part scientific name that is used by botanists all over the world. The first part is the genus or generic name. The second part is the species or specific name. The genus is always capitalized and the species is not. Both names are usually underlined or italicized. i will try when possible to link the scientific names mentioned to the incredible database hosted by the United States Department of Agriculture http://plants.usda.gov/java/ An example is (Daucus carota). This is the name for the cultivated carrot. The USDA database hosts a plethora of information including pictures, distribution maps, invasiveness, nativity, habitat and some uses. Plants that share a genus name are similar but often differ in leaf shape, size, habitat, color, palatability or other characteristic. Plants that have the same species name often look almost exactly the same but may still look rather different due to breeding. (Daucus carota) is also the name for the wild plant known as Queen Anne’s Lace. Modern family names for plants take part of the name of a typical genus in the family and then add aceae to the ending. For example, the name of the Celery (Apium graveolens) family is Apiaceae. In the notations below sp. = one species and spp. = multiple species of the same genus. Often it is possible to guess whether a plant is edible, medicinal, or poisonous simply by the family it is in. However, this is not always the case. One example is the Celery family mentioned above which contains many vegetables and spices as well as some of the most poisonous plants in the world! Learning the scientific names of plants helps to aid certainty in identification. Many plants that are very different share the same common names such as the Eastern Hemlock tree (Tsuga canadensis) in the Pine family (Pinaceae) and the Poison Hemlock plant (Conium maculatum) in the Celery family. Approximately 250,000-275,000 species of flowering plants have been named in the world. Scientists have grouped these into around 15,000 genera and those are divided into around 400+ flowering plant families (Heywood, Brummitt, Culham, & Seberg, 2007). You will know something significant about the majority of plants that you see in the temperate world if you learn the top 30 families around you!!! Another approximately 40,000 species of plants that are precursors to the flowering ones have been named as well. These plants include Conifers, Ferns, Mosses, Hornworts, Liverworts and others. i tend to select common names for families that are linked to the typic genus they are named after. i also tend to capitalize most parts of plant names. My reasoning is that the plants are just as important as people who always have their names capitalized. However, my name and the i that signify me are not capitalized in remembrance of the need for humbleness. The world contains many thousands of edible plants (Facciola, 1998; Johnson, 1999; Stanford, 1934; Sturtevant & Hedrick, 1972). North America has at least 4,000 edible species of plants alone (Couplan, 1998). Many indigenous groups have traditionally made use of hundreds of local plants on the continuum between food and medicine (Moerman, 1998). 75% of the world’s calories come from only 12 plants (Groombridge & Jenkins, 2002, p. 41). The great proportion of all nutrients and calories come from Wheat (Triticum spp. ), Corn (Zea mays), and Rice (Oryza spp.) (Cunningham, 2007, p. 189). Staples can vary from region to region. In the tropics Sweet Potatoes (Ipomoea batatas), Cassava (Manihot esculenta) and Sugar Cane (Saccharum officinarum) are staples. Barley (Hordeum vulgare), Oats (Avena sativa), Rye (Lolium sp. ), Soybeans (Glycine max) and Potatoes (Solanum tuberosum) are staples of temperate places in the world. Drought tolerant crops like Millets (Panicum miliaceum, Eleusine coracana, Echinochloa esculenta, Pennisetum glaucum) and Sorghum (Sorghum bicolor) are staples in Africa. The vast majority of foods come from very few crops but many groups from Asia to Africa and Latin America still makes use of hundreds of plants where they live (Groombridge & Jenkins, 2002, p. 45). When picking wild plants make sure that you get the plants positively identified. Know what part to use (Leaves, Roots, Flowers, Fruits). Also know how to use (Fresh, Steamed, Sautéed, Tea, Infused or Tinctured) and what time of year to harvest. It is often easiest to start by going out with experienced people. A good guide is also essential (Brill & Dean, 1994; Duke & Foster, 1999; Horn, Duhl, Hemmerly, & Cathcart, 2005; Peterson, 1978). Take the time to know the few really toxic plants as much as choice edibles. Don’t pick by roadsides or other chemically intensive areas. If you only need the top then leave the roots of perennials. Don’t over harvest, use all of your senses and give thanks!!! For the next class we will cover pages 1-3 and both inside covers of Botany In a Day 6th ed. What are five plants you hold closely? What food is ready for harvest around you right now? What are a few plants blooming around you right now? Brill, S., & Dean, E. (1994). Identifying and Harvesting Edible and Medicinal Plants in Wild (and Not so Wild) Places. New York: Hearst Books. Stanford, E. E. (1934). Economic Plants. New York, London: D. Appleton-Century Company, Inc.